The third edition of this contest gathered 100 judges who tasted 2,000 wines and spirits from 35 countries around the world. Argentina was recognized with diverse awards. 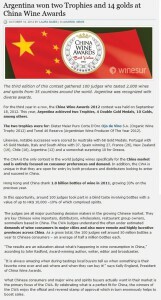 For the third year in a row, the China Wine Awards 2012 contest was held on September 18, 2012. This year, Argentina achieved two Trophies, 4 Double Gold Medals, 10 Golds, among others. 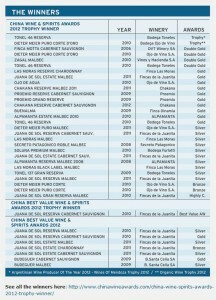 The two trophies were for: Dieter Meier Puro Corte D’Oro Ojo de Vino S.A. (Organic Wine Trophy 2012) and Tonel 46 Reserva (Argentinian Wine Producer Of The Year 2012). Likewise, notable successes were scored by Australia with 68 Gold Medals. Portugal with 45 Gold Medals, Italy and South Africa with 37, Spain winning 27, France (26), New Zealand (19), Chile (16), Argentina (12) and a somewhat surprising 10 for Greece. 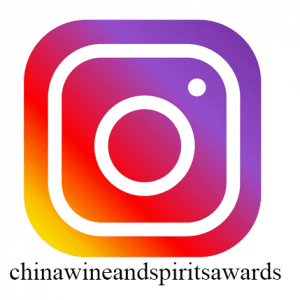 The CWA is the only contest in the world judging wines specifically for the China market and is entirely focused on consumer preferences and demand. 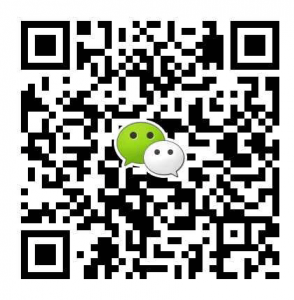 In addition, the CWA is unique in that they are open for entry by both producers and distributers looking to enter and succeed in China. Hong Kong and China drank 1.8 billion bottles of wine in 2011, growing 33% on the previous year. In this opportunity, around 100 judges took part in a blind taste involving bottles with a value of up to HK$ 10,000 –10% of which comprised spirits. The judges are all major purchasing decision makers in the growing Chinese market. They are key Chinese wine importers, distributors, wholesalers, restaurant group owners, sommeliers based in China. The CWA Judges understand the often under estimated demands of wine consumers in major cities and also more remote and highly lucrative provinces across China. As a gross total, the 100 judges sell around 50 million bottles a year to Chinese consumers – an average of half a million bottles each. “The results are an education about what’s happening in wine consumption in China,” according to John Radford, Award-winning author, writer, editor and broadcaster. “It is always amazing when during tastings local buyers tell us when something is their favorite wine ever and ask where and when they can buy it!” says Kelly England, President of China Wine Awards. What Chinese consumers and major wine and spirits buyers actually want in their market is the primary focus of the CWA. 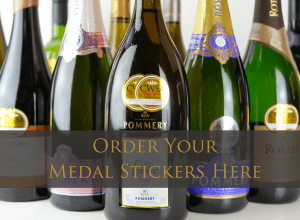 By celebrating what is a perfect fit for China, the winners of the CWA enjoy the official and revered stamp of approval which in turn enormously helps to boost sales.